In the darkest hours of 1910, mutiny, doubt, and disaster threatened to destroy Jack Winslow's secret American expedition to discover the South Pole. 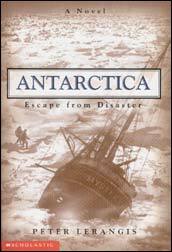 When the explorers' ship, the Mystery, was frozen in the Antarctic ice, Winslow and his sons were forced to make a daring rescue attempt... at the risk of their lives. The wind, the cold, and some of their own crewmen fought against them. Nobody thought they could survive.